Application/Usage Industrial and commercial areas,chemical or pharmaceutical manufacturing company,food industries,malls,schools etc. We are providing services of Industrial PU floor.The subject of a polyurethane or epoxy coating for a garage floor eventually comes up when deciding on what materials to use for your project. 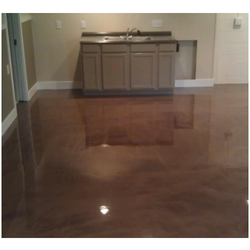 Epoxy and polyurethane are great for protecting your floor against stains, damage, chemicals, oils, and wear. They are both light reflective, easy to clean, and long lasting.